August 2010 marked the seventieth anniversary of the assassination of Leon Trotsky at the hands of a Stalinist agent. Here we reprint an article by British Marxist Duncan Hallas on the life and legacy of Trotsky. In May 1940, Leon Trotsky wrote an article entitled "Stalin Seeks My Death." It was an accurate forecast. Three months later, on August 20, the Stalinist agent Ramón Mercader, alias Frank Jacson, drove a pickax into Trotsky’s brain in Coyoacan, Mexico. The assassination was the last of the wholesale murders by which the Stalinist bureaucracy destroyed the Bolshevik old guard. Rykov, Lenin’s successor as chairman of the Council of People’s Commissars, was shot. Zinoviev, president of the Communist International in Lenin’s day, was shot. Bukharin and Piatakov—“the most able of the younger members of the Central Committee,” according to Lenin’s “Testament”—were shot. Rakovsky and Radek both perished. Tens of thousands of old party members disappeared forever in Arctic “labor camps.” The militants who made the October Revolution were practically annihilated. Only one of the leading figures of the years of revolution and civil war survived. Joseph Stalin, the man Lenin proposed should be removed from office as General Secretary, now ruled Russia more despotically than Ivan the Terrible had ever done. Trotsky’s final verdict on these events was written in the year before his death. Stalinism had first to exterminate politically and then physically the leading cadres of Bolshevism in order to become that which it now is: an apparatus of the privileged, a brake upon historical progress, an agency of world imperialism. The hopes of the October Revolution had been buried by the Stalinist terror. There had been no simple counterrevolution. The landowners, capitalists, and courtiers of tsarist times had not recovered their possessions. Stalin founded no dynasty and the leading members of the bureaucracy acquired no legal title to the “public” property. Yet the working people, the officially proclaimed “ruling class,” were deprived of all political rights, even such minimal rights as they had won under tsarism. The trade unions had become a machine for disciplining the workforce. And what a discipline. On December 28, 1938, Stalin signed a decree which laid down that “workers or employees who leave their jobs without permission or are guilty of grave offences against labor discipline are liable to administrative eviction from their dwellings within ten days without any living quarters being provided for them.” The conditions of a nineteenth century company town were imposed on the workers in the “workers’ state”! The same decree abolished the right of a worker to a paid holiday after five and a half month’s employment and dealt with bad time-keeping as follows: “A worker or employee guilty of coming late to work, of leaving for lunch too early or returning too late or idling during working hours is liable to administration prosecution.” Managers failing to bring prosecutions “are themselves made liable to dismissal or prosecution.” All this, of course, applied to “free” workers. For the really obstinate offenders there were the labor camps. Big inequalities in wages were introduced. There was no question of negotiation, of course. Incentive payment schemes became general. Out of the first successful nationwide workers’ revolution had grown a society that reproduced the inequalities and oppression of capitalism and was ruled by an iron dictatorship, a dictatorship not of the working class but over the working class. The whole of the latter part of Trotsky’s political life was spent in fighting this reaction, in analyzing it and explaining its causes and in struggling to keep alive the revolutionary socialist tradition against the crushing pressure of Stalinism in Russia and internationally. Trotsky was born in the Ukraine in 1879, the son of a Jewish farmer. At that time the labor movement did not exist in the tsarist empire. In fact an industrial working class hardly existed. There were a few great nobles, a more numerous lower nobility who officered the army and the state machine, a middle class of merchants, lawyers, doctors and so on, and a vast mass of peasants. That was the Russian Empire of the time, and over it the Tsar ruled as absolutely as Louis XIV had ruled France. There was no parliament, no free press, no freedom of movement, no equality of citizens before the law. Until 1861 the great mass of the Russian people—the peasants—had been legally unfree serfs, unable to leave the estate they were born on, bought and sold by their masters along with the land. Russia was backward, medieval—so backward that in many ways it was more like France before the great revolution of 1789 than the capitalist countries of Western and Central Europe. But a great change was coming. In the years of Trotsky’s boyhood and youth, industry was developing fast in Russia, fuelled by foreign loans and foreign technicians. New classes were developing, a capitalist class, still much weaker than in the West, and a real industrial working class. The growth of these classes meant, in the long run, that the tsarist regime could not last. As late as 1895 the tsarist minister of finance could write: “Fortunately Russia does not possess a working class in the same sense as the West does; consequently we have no labor problem.” He was already out of date. By 1887 there were already 103,000 metalworkers in Russia, by 1897, 642,000. By 1914 there were 5,000,000 workers out of a population of 160,000,000. This young working class developed a militancy and record of mass struggle unparalleled since the heroic period of the British working class in the 1830s and 1840s. In the early years of the twentieth century a wave of mass strikes shook tsarism to its foundations, leading to the explosion of 1905. A new form of working class self-government, the “soviet” or workers’ council, was invented by unknown Russian working men. For a time there was a “dual power,” the power of the workers organized in soviets confronting the panic-stricken government of the Tsar. The whole regime tottered. But in the end it was able to re-establish its power. The revolutionary workers confronted the peasant army and the peasants were still loyal to the Tsar. A murderous repression followed. Trotsky grew up with the movement. While still in his teens he joined a revolutionary group in Nikolayev, the South Russian Workers Union. In 1898 he was arrested and kept in various jails until, in 1900, he was deported to Siberia. In the summer of 1902 he escaped and by the autumn he had joined Lenin in London. By this time Trotsky had become a Marxist and a writer of some fame. Lenin welcomed him and proposed that he join the editorial board of Iskra (The Spark), the socialist party paper that was printed in London and smuggled into Russia. The proposal was vetoed by the senior member of the board, Plekhanov, one of the founders of the party and a future Menshevik. For the split in the Russian socialist party was only a few months ahead and relations between Lenin and some of his co-editors were already tense. The party at that time consisted of a handful of emigrés in London, Zurich, and other European cities and a number of illegal groups of workers and students in some of the Russian industrial centers and in Siberian exile. The split, which came at the Second Congress, held in Brussels and then London in 1903, was on the face of it about a comparatively unimportant organizational question. In fact, the underlying differences were of vital importance. The minority (Mensheviks) were moving toward the view that the Russian capitalist class could lead this struggle and consequently tended to favor a looser organization oriented to semi-legal work. Neither side supposed that a socialist revolution was possible in a country as backward and underdeveloped as Russia. That would come later, after a period of capitalist economic development under a democratic republic. In 1905 the revolutionary exiles were able to return. Trotsky, now a Menshevik, played a big part in the unsuccessful 1905 Revolution. Toward the end of the year he became president of the Petrograd Soviet of Workers’ Deputies, then the most important workers organization in Russia. Its liquidation by the reviving tsarist military and olice machine marked the turning point in the revolution. Trotsky was imprisoned again. Put on trial for his life, he defied the Tsar from the dock: “The government has long since broken with the nation.… What we have is not a national government but an automaton for mass murder.” The still-smoldering revolutionary movement made the government cautious. The main charge—insurrection—was dismissed. But Trotsky and fourteen others were sentenced to deportation to Siberia for life, with loss of all civil rights. In the years of reaction after 1906, the revolutionary organizations, harassed by police spies and unremitting repression, withered and decayed. The Menshevik organizations in Russia virtually disappeared. Even Lenin’s Bolshevik group, now split in to two, a left and a right (with Lenin on the right), shrank into a shadow of its former strength. In the emigré circles bitter factional disputes developed. Trotsky escaped again from Siberia in 1907 and soon found himself nearly isolated. Repelled by the Menshevik drift to the right and unable to overcome his hostility to the Bolsheviks, he became a lone wolf. His one positive achievement in these years was the elaboration of his theory of “permanent revolution.” Its central idea was that the coming revolution in Russia could not stop at the stage of a “democratic republic” but would spill over into a workers’ revolution for workers’ power and would then link up with workers’ revolution in the more advanced capitalist countries or be defeated. It was not so very different from Lenin’s later conception, but Trotsky’s distrust and dislike of Lenin prevented him from joining forces with the only real revolutionary organization—the Bolsheviks. On August 4, 1914, the world was transformed. The long-predicted imperialist war broke out and the leaders of the big social democratic parties forgot about their Marxism and internationalism and capitulated to “their own” governments. The Socialist International broke into pieces. In every belligerent country, the movement split between the renegades and the internationalists. In September 1915, thirty-eight delegates from eleven countries met at Zimmerwald in Switzerland to reaffirm the principles of international socialism. Trotsky wrote the internationalist manifesto issued by the conference. There were both revolutionaries and pacifists at Zimmerwald. They were soon to split. The revolutionary nucleus became the forerunner of the Third (Communist) International. Revolutionary opposition was growing in all the warring states but it was in Russia that the break came. In February 1917, mass strikes and demonstrations overthrew the Tsar. It was the working-class militants of Petrograd—many of them Bolsheviks—that led the movement. From the beginning, the leaders of the Soviets of workers, peasants, and soldiers’ deputies were in a position to sweep away the crumbling facade of the “Provisional Government” and take power. But they did not do so, because they were, in the majority, Mensheviks and Social-Revolutionaries (the peasant party) who believed that a “democratic republic” was necessary to permit the growth of capitalism so as to lay the basis for socialism in the distant future. This meant continuing the war and “disciplining” the workers and peasants. Even some of the Bolsheviks wavered, notably Kamenev and Stalin, the two central committee members who had escaped from Siberia to take charge of the party in Petrograd. But when Lenin returned in April he would have none of this. “Down with the Provisional government,” “Peace, Land, and Bread” were his slogans. At first a minority in his own party, Lenin won first the party and then the majority of the Soviets for his revolutionary position. It was essentially the same as Trotsky’s “permanent revolution” and in July, Trotsky, together with a group of ex-left wing Mensheviks, entered the Bolshevik Party. By the autumn, the majority of the workers were supporting the Bolsheviks. Under the slogan of “All power to the Soviets,” the Provisional Government was overthrown. In Petrograd hardly a hand was lifted to support it. The next years were the years of Trotsky’s greatest fame. First as People’s Commissar for Foreign Affairs and then as People’s Commissar for War, he was second only to Lenin as the moving spirit of the revolution. These were the years of revolutionary optimism. Everything seemed possible. Though the Soviet government had to fight desperately against massive foreign intervention—the armies of 14 powers fought against the revolution—and against foreign-armed and -financed White armies, the whole of Europe seemed on the verge of revolution. Revolutionary Soviet regimes were actually established in Hungary, in Bavaria, in Finland, in Latvia. The German Kaiser, the Austrian Emperor, the Turkish Sultan were all overthrown. The whole of Germany seemed on the brink of red revolution. In Italy, mass strikes and violent demonstrations paralyzed the capitalist state. The opportunists who before the world war summoned the workers to practice moderation for the sake of gradual transition to socialism…are again demanding self renunciation of the proletariat.… If these preachments were to find acceptance among the working masses, capitalist development in new, much more concentrated and monstrous forms would be restored on the bones of several generations—with the perspective of a new and inevitable world war. Fortunately for mankind this is not possible. In fact, the success of the German Revolution hung in the balance. The opposing forces were nearly equal. Success would have changed the course of European and world history. Failure meant the eventual triumph of reaction not only in Germany, but also in Russia. For the civil war ruined the already backward Russian economy and dispersed the Russian working class. The White counterrevolution was beaten because the great majority of the Russian people—the peasants—knew that the revolution had given them the land and that a restoration would take it back again. Yet by the end of the civil war, the workers had lost power because, as a class, they had been decimated. By 1921, the number of workers in Russia had fallen to 1,240,000. Petrograd had lost 57.5 percent of its total population. The production of all manufactured goods had fallen to 13 percent of the already miserable 1913 level. The country was ruined, starving, held together only by the party and state machines developed during the civil war. It was a situation that had not been foreseen. At the time of the Brest Litovsk peace with Germany in 1918 Lenin wrote: “This is a lesson to us because the absolute truth is that without a revolution in Germany we shall perish.” For, of course, there could be no question of the Russian working class, a small minority with a weak economic base, maintaining a workers’ state for any length of time without integrating the Russian economy with that of a developed socialist country. It was clear to us that without aid from the international world revolution, a victory of the proletarian revolution is impossible. Even prior to the revolution, as well as after it, we thought that the revolution would occur either immediately or at least very soon in other backward countries and in the more highly developed capitalist countries, otherwise we would perish. Notwithstanding this conviction, we did our utmost to preserve the Soviet system, under any circumstances and at all costs, because we know we are working not only for ourselves but also for the international revolution. By 1921, the international revolution had been beaten back and the communist regime in Russia faced another desperate crisis. The peasant masses, freed from the fear of landlordism, were moving into violent opposition. Peasant riots in Tambov, the Kronstadt rising, and the strikes in support of it showed that the regime no longer enjoyed popular support. It was becoming a dictatorship over the peasantry and the remnants of the working class. A retreat was essential. The New Economic Policy, from 1921 onwards, recreated an internal market and gave the peasantry freedom to produce for profit and to buy and sell as they wished. Private production of consumer goods for a profit was also permitted and the publicly-owned large-scale industry was instructed to operate on commercial principles. The result was a slow but substantial economic recovery, together with mass unemployment—never less than a fifth of the slowly reviving industrial working class—and the development of a class of capitalist farmers, the kulaks, out of the ranks of the peasantry. By the middle 1920s the economic output levels of 1913 had been reached and in some cases passed. By that time the balance of social forces had altered fundamentally. Comrade Trotsky talks about the “workers’ state.” Excuse me, this is an abstraction. It was natural for us to write about the workers’ state in 1917 but those who now ask “Why protect, against whom protect the working class, there is no bourgeoisie now, the state is a workers’ state” commit an obvious mistake.… In the first place, our state is not really a workers’ state, but a workers’ and peasants’ state.… But more than that. It is obvious from our party program that…our state is a workers’ state with bureaucratic distortions. Since then, the “bureaucratic distortions” had grown enormously, the ruling party itself had grown enormously, and the ruling party itself had become bureaucratized. In the absence of a working class with the strength, cohesion, and will to rule, the party had had to substitute for the class, and the party apparatus was increasingly substituting for the party membership. A new group of “apparatchiks” had grown up alongside the kulaks and the “nepmen” (petty capitalists). Trotsky, in one of his most striking phrases, described politics as “the struggle for the surplus social product.” Between these three groups such a struggle developed over the heads of the mass of the poorer peasants and against the working class. The struggle was reflected in the ranks of the now bureaucratized party, especially among its leaders. Trotsky, by now thoroughly alarmed at the rightward trend, became the chief spokesman of a tendency that took up the fight, started by Lenin in the last months of his life, for the democratization of the party and the revival of the Soviets as real organs of the workers and peasants. An essential part of the program of the Left Opposition (as Trotsky’s group was called) was the more rapid and planned development of Russian industry. For Marxists, it was out of the question for democratization to succeed without an increase in the numbers, self confidence, and specific weight of the working class. Opposed to the left was a right wing tendency for which Bukharin became the spokesman. This argued for stability, for accumulation “at a snail’s pace,” and for giving priority to keeping the peasantry happy, including the kulaks. The perspective of the opposition was one of peaceful reform. The pressure of events and of the opposition could reform the party and the country, it thought. In the event, the extent of the bureaucratic degeneration was shown by the ease with which the opposition was defeated. Though it included some of the most distinguished members of the party and was joined, after 1926, by the group around Zinoviev, Lenin’s closest collaborator in exile, and Krupskaya, Lenin’s widow, as well as by the “ultra-left” democratic centralist group, it was overwhelmingly voted down in party meetings packed by Stalin’s yes-men. 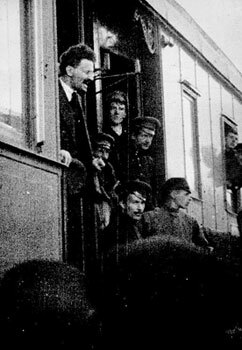 In October 1927, Trotsky and Zinoviev were expelled from the party. Soon they and thousands of other oppositionists began the journey into exile. The opposition had been smashed and from their places of exile its leaders predicted a dire danger from the right. The Soviet “Thermidor,” the overthrow of the party by the representatives of the kulaks and nepmen, was imminent. And indeed the regime did face a danger from the right. In 1928 the kulaks, encouraged by the liquidation of the left, engineered a “grain strike,” a hoarding operation which faced the cities with starvation. The sequel showed how grossly they—and the opposition—miscalculated the strength of the rival forces. The bureaucracy executed a violent change of course. After years of appeasing the rich peasants they resorted to forced collectivization, to the “liquidation of the kulaks as a class.” Under the guise of one-party rule, a narrow clique of bureaucrats ruled Russia. And they were soon to become the puppets of one man. By 1930, Stalin was the new Tsar, in fact if not in form. With the forced collectivization came a frenzied program of forced industrialization. Schemes far exceeding the most ambitious plans of the most optimistic members of the opposition were put in motion, only to be superseded by others still more far-reaching. “Fulfill the five year plan in four years” became the slogan. The man who yesterday ridiculed the moderate plans of the opposition as utopian now wished to “catch up and outstrip” the advanced capitalist countries in a few years. The first five year plan did succeed in laying the basis for an industrial society. It did on the basis of the most brutal exploitation of the workers and peasants. Real wages fell drastically. The draconically regimented “free” workers were supplemented by an army of slave laborers, mostly ex-peasants, employed on large-scale construction jobs under appalling conditions. All vestiges of democratic rights disappeared. A fully-fledged totalitarian regime emerged. The workers’ state had been destroyed years earlier, in his opinion and capitalism restored. Trotsky would accept neither of these positions. Against the capitulators he insisted on the need for Soviet democracy. Against the left he insisted on the possibilities of peaceful reforms. It was an unreal assessment and Trotsky was to abandon it 18 months later. The impetus for the change came from events in Germany. The Left Opposition had been concerned at least as much with the International as with Russia. The Third International in its early years had been far from being the tool of Moscow. But with the receding of the revolutionary mood in Europe the parties became more attached to the one surviving “Soviet” regime and more dependent on it. Advice from Moscow became the most important source of their political ideas. Increasingly the Russian-, and hence apparatchik-, dominated executive of the International began to interfere with the national life of the parties. The myth of the “Soviet Fatherland” became more and more important to European and Asian Communists. Gradually the more independent spirits and the more serious Marxists were eliminated from the leaderships. It took ten years to reduce the world movement to the position of Moscow’s foreign legion. By 1929 the process was complete. While the right-center bloc ruled Russia the policy of the International was pushed to the right. Semi-reformist policies were promoted, and they led to a number of avoidable defeats. The opposition sharply criticised the Comintern policies and sought to develop contacts with dissident members of the foreign parties. But after Stalin had eliminated his former “rightist” allies in Russia, the Comintern was swung violently to the left, to the lunatic left in fact. A period of “general revolutionary offensive,” the “third period” was proclaimed. The German workers’ movement was smashed. The Communist Party surrendered without a fight. Hitler came to power and preparation for the Second World War began. This terrible defeat caused Trotsky to break with the International. “An organization which has not been awakened by the thunderbolt of fascism…is dead and cannot be revived.” Soon after this, he abandoned his reformist position on Russia. A new revolution was necessary to remove the bureaucratic dictatorship. Yet he did not modify his view that Russia was a “degenerated workers’ state.” For the few years left to him he clung to that abstraction—a “workers’ state” in which the workers were not only not in power but were deprived of the most elementary political rights. It was an error that was to have a lasting and pernicious influence on the revolutionary left. Trotsky was now nearly alone. Soon after the German catastrophe the great purges began in Russia. Stalin consolidated his personal rule by the mass murder of the former capitulators, of the former rightists and of most of his own early supporters. All alike were denounced, along with Trotsky, as agents of Hitler, counterrevolutionaries, spies, and saboteurs. There were a series of grotesque “show trials,” at which prominent leaders of the revolution in Lenin’s time were made to confess their guilt—and that of the monster Trotsky. The Comintern was now swung rightwards again. Stalin’s foreign policy required an alliance with the “western democracies.” The “popular front”—the subordination of the workers’ parties to liberals and progressive Tories—was the new line. It enabled Stalin to strangle another revolution—Spain. Trotsky called the Spanish defeat “the last warning.” All his energies in the last years of his exile, in France, Norway, and then Mexico, were spent in trying to create the nucleus of a new International, the Fourth. Its founding conference took place in 1938 under the shadow of multiple defeats for the working class. Trotsky now had less than two years to live. It was his imperishable achievement to keep alive the tradition of revolutionary Marxism in the decades when it was all but extinguished by its pretended supporters. Trotsky was far from infallible. Lenin had written in his testament of Trotsky’s “too far-reaching self-confidence” and it was his misfortune, in his last years that few among his adherents were capable of independent thinking. That he towered over his associates was at once his strength, and his tragedy. Perhaps no other man could have withstood isolation and attack as he did. His contribution to revolutionary socialism and to the working-class movement was unsurpassed. He was one of a handful of truly great figures the movement has produced. My high (and still rising) blood pressure is deceiving those near me about my actual condition. I am active and able to work but the outcome is evidently near. These lines will be made public after my death. I have no need to refute here once again the stupid and vile slanders of Stalin and his agents: there is not a single spot on my revolutionary honor. I have never entered, either directly or indirectly, into any behind-the-scenes agreements or even negotiations with the enemies of the working class. Thousands of Stalin’s opponents have fallen victims of similar false accusations. The new revolutionary generations will rehabilitate their political honor and deal with the Kremlin executioners according to their deserts. For forty-three years of my conscious life I have remained a revolutionist: for forty-two of them I have fought under the banner of Marxism. If I had to begin all over again I would of course try to avoid this or that mistake, but the main course of my life would remain unchanged. I shall die a proletarian revolutionary, a Marxist, a dialectical materialist, and, consequently, an irreconcilable atheist. My faith in the communist future of mankind is not less ardent, indeed it is firmer today, than it was in the days of my youth. Natasha has just come up to the window from the courtyard and opened it wider so that the air may enter more freely into my room. I can see the bright green strip of grass beneath the wall, and the clear blue sky above the wall, and sunlight everywhere. Life is beautiful. Let the future generations cleanse it of all evil, oppression, and violence, and enjoy it to the full. Duncan Hallas was a leading member of the British Socialist Workers’ Party, and is the author of Trotsky’s Marxism (Haymarket, 2006) and The Comintern (Haymarket, 2010). Originally a series of articles in the SWP’s Socialist Worker, this article was reprinted as a pamphlet in 1970.